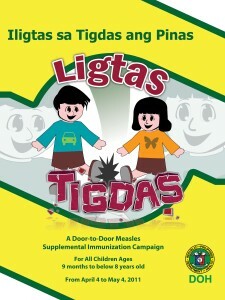 The staff of RHU II, headed by Dr. Emilio Raymund Claudio, Doctors-To-The-Barrios, has just completed the one month house-to-house Measles-Rubella Vaccination Campaign on May 2, 2011 – 2 days ahead of schedule. The RHU II Department has 11 barangays under its catchment area, all of which are in the upland areas of the municipality. These 11 barangays comprise majority of Jagna’s land area, with an estimated population of 14,000 + – 40% of the total population. This program is a national vaccination campaign against two highly infectious diseases namely Measles and Rubella (German Measles) with the former being a potentially life-threatening illness in some instances. The staff of the RHU II, comprised only of 9 people (1 MD, 2 PHNs, 3 regular midwives, and 3 casual midwives) set out to complete the campaign which started on April 4, 2011. They utilized a modified house-to-house campaign, apart from the ideal complete house-to-house methodology as suggested by the national health department. The modified house-to-house ensures that the houses in the reachable areas of a barangay are visited and those in the far-flung and hard to reach areas of are gathered in one place. This methodology was consulted and approved by the municipality’s DOH Representative. The staff gives out immunization cards to the kids after vaccination and posts a sticker on the door of each stating that it has already been covered. The RHU II department’s schedule is as follows: April 4 Brgy. Can-ipol ; April 5-6 Brgy. Lonoy ; April 7 Brgy. Buyog ; April 11-12 Brgy. Odiong ; April 13 Brgy. Balili ; April 14-15 Brgy. Mayana ; April 18-19 Brgy. Tubod Monte ; April 25 Brgy. Cantuyoc ; April 26-27 Brgy. Boctol ; April 28-29 Brgy. Cabungaan ; May 2 Brgy. Calabacita. The staff were also able to include free pap smears in some barangays namely Odiong, Tubod Monte, Balili, and Mayana. Specimens will be sent to the USA through Philos-health, our partner NGO, for official reading. The staff of RHU II sends out their sincerest gratitude to the municipal and barangay government for their unwavering support. 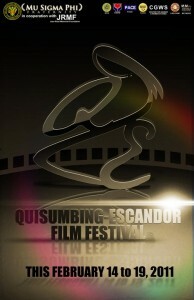 The Q uisumbing-Escandor Film Festival For Health Reaches the Municipality of JAGNA, BOHOL. 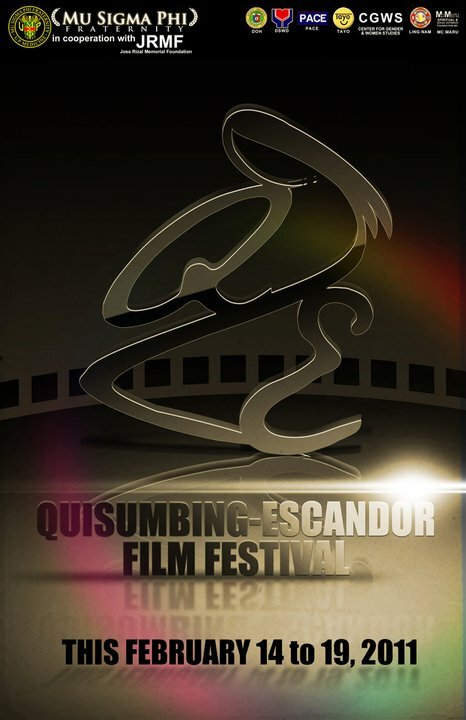 The QUISUMBING-ESCANDOR FILM FESTIVAL (QEFF) FOR HEA LTH is an acclaimed nationwide film-making competition that innovatively promotes health awareness through the visual power of Cinema. In 2008, the 1st QEFF with its theme “Malayo sa bituka…” sparked proactive campaigns for health reform and propelled its organizers, the Mu Sigma Phi Fraternity of the University of the Philippines College of Medicine, to be awarded as one of the Ten Accomplished Youth Organizations of the Philippines (TAYO) by the National Youth Commission (NYC). In 2011, the 2nd QUISUMBING-ESCANDOR FILM FESTIVAL, together with the Philippine Association of Communication Educators (PACE) through President Flordeliz Abanto, takes on the theme “Sa ngalan ng ama, ng anak, at ng ina…” to cast the spotlight on Maternal and Child Health. As our reproductive health statistics and indicators persist below the Millennium Development Goals for 2015, QEFF is poised as an innovative and timely venue for health awareness, discussion, and action. The films from this festival were shown all over the Philippines through various partner organizations, universities, and municipalities, and even in the Senate through the efforts of Senator Pia Cayetano. This year, the municipality of Jagna, Bohol, through the coordination of Dr. Emilio Raymund Claudio, Municipal Health Officer of Jagna RHU II, and a proud member of the Mu Sigma Phi Fraternity also partnered with his colleagues in bringing these films to the municipality. The films were shown to the graduating class of the San Miguel Academy, a private high school in Brgy. Mayana of Jagna on March 3, 2011. The next was in Capt. Goyo Hall in the local government building on March 24, 2011 where representatives from each department attended. The films shown were the short films “Limang Libo” , “Sa Direksyon ni Makoy”, and the documentary “Ang Ina” – all winners of the said film festival. An open forum followed after with Dr. Claudio as the resource person. These films will be continually shown throughout the entire year as an advocacy to improve Maternal and Child Health in the municipality.